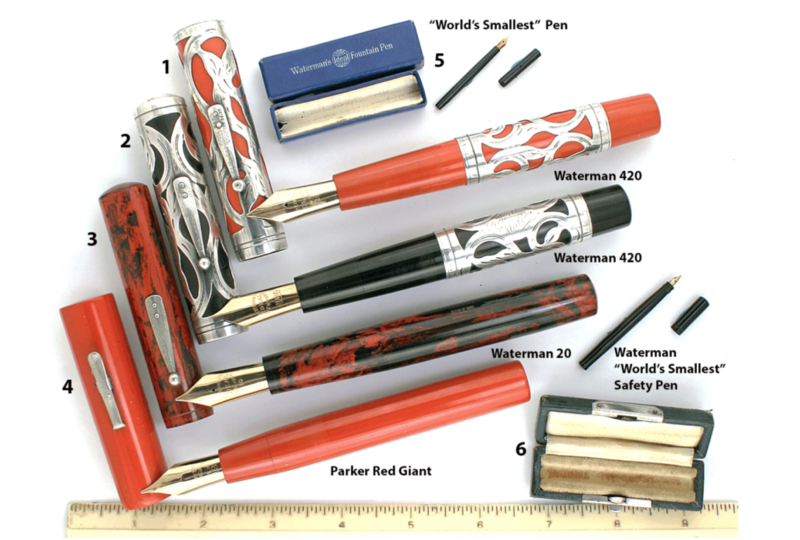 This is a 1900 Waterman 420 eyedropper-fill in Black Hard Rubber with Sterling Silver Filigree overlay. The “20″ was the largest pen Waterman produced, and the sterling silver contrasting on the black underlay (no oxidation at all), is exquisite. Indicia engraved “Dewill Miller.’ in attractive script. Miller (1857 – 1911) was a Professor of History and Mental Philosophy at Pennington Seminary, Pennington, PA, as well as a Methodist Minister. He was also an obsessive book collector. Barrel bottom imprinted “20″ (a little worn, but fully readable). Minor wear here and there to the overlay, noticeable only with a loop, with no cracks, tears, etc. Three or four small dings in the cap top. Near mint. Very minor signs of ink in the cap and barrel. Huge No. 10 nib (medium/broad). Check out our Catalog to view this item’s availability! Item #2 in Catalog #86.